This paper discusses the effects of the dilution process on levels of aquifer contamination attenuation, developing analytical equations for application in theoretical and practical cases. The key finding is that, in aquifers, the dilution process causes a reduction of the contaminant concentration. Analytical equations for the assessment of the contaminant attenuation capacity, by means of the dilution process in an aquifer, are put forward. In particular, the attenuation of the contaminant concentration in an aquifer, and thus the dilution, is described by the volumetric flow rate per unit width perpendicular to the flow direction (q u). Moreover, a classification of q u was developed, considering six classes of attenuation capacity due to dilution. For the equations validation, nitrate contamination attenuation due to dilution was analysed in two sample areas in Piedmont (North-West Italy). 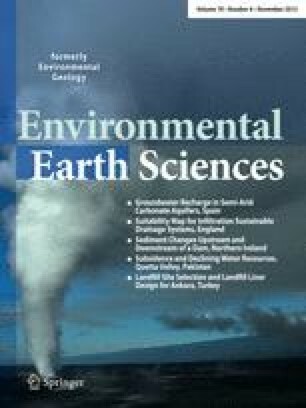 The results confirmed the hypothesis, evidencing high nitrate concentrations in areas with low q u values, connected to low dilution rate of the contaminant in the groundwater; vice versa, low nitrate concentrations were evidenced in areas with high q u values, due to a high nitrate dilution rate.